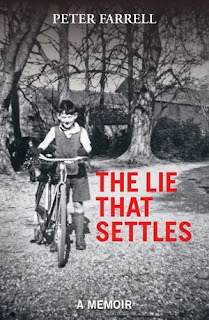 On Thursday night Peter Farrell's memoir 'The Lie That Settles', was given a terrific send off into the world at Wellington's literary birthing unit, the beating heart of book launches, Unity Bookshop. How grateful are we all to have Unity in our city. It was a very special evening with the shop over-flowing with friends and supporters. I've been too many book launches but I don't know that I've ever seen such a big crowd. This is a self-published memoir and even before Dame Fiona Kidman could officially launch the book, Unity had sold out. Modest author Peter went to his car, where he had optimistically left ten extra books - just in case - he could have done with 50 extra! Linda Niccol, author, screenwriter, and a Director of Mission Hall Creative spoke first about the work they had done on the overall design of the book. They wanted the cover to speak to the audience and capture the essence of the story being told. "Upon reading the book I discovered there was an air of the unknown and mystery surrounding Peter’s life. The image of Peter on his bike, in a park or driveway, is a lovely image of a young boy on his way, setting off on his life journey, which I feel captures the book perfectly.” Rebecca Horrocks, Designer, Mission Hall. Dame Fiona Kidman (right with author) was one of the first mentors that Peter had when he started creative writing and they've stayed in touch over the years, so it was very special that she was able to launch his memoir. She is one of our much-loved literary icons and what we don't always see in the writing world is just how much Dame Fiona puts back into the writing community, supporting other writers. Thursday evening was a lovely celebration of literary friendships. "If I say that it gives me enormous pleasure to launch Peter Farrell’s book, it may sound like one of those grand clichés of opening nights, and yet it is so true of this book, one that means a lot to me in personal terms. I met Peter some 15 or 16 years ago when he had first confronted his past and was setting out on the journey of memoir. He came to one of the writing groups I ran then, a brave and humble gesture for a man of so many talents. He had a story to tell and he needed to find a way to express it, even though the journey had, in a sense, only begun. We became firm friends from the beginning, and any suggestion that I ‘taught’ Peter is misleading – in the beginning we worked side by side as he began expressing himself through the written word, and then, when he moved on to other more formal writing seminars, we simply kept in touch, and formed a regular lunch a lot group with some of the people who attended those early sessions. In this sense, I’ve been able to keep track of the book as it’s evolved over the years. Memoir is no flash in the pan, memory casts a wide net, and the further it is flung the more there is to catch and process. One thing inevitably leads to another, and the fact that this book has taken some 15 years in the making is no surprise. I’ve always said that there is no such thing as an ordinary life, but it has to be said that Peter has had a particularly rich and extraordinary life, albeit one that began with a lie - and lies once told are hard to unpick. 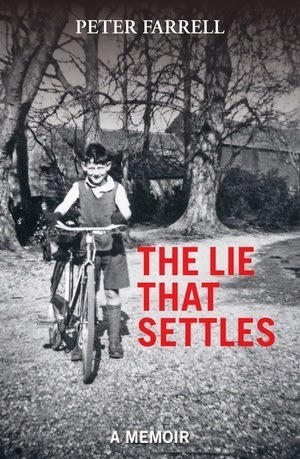 His story, in The Lie That Settles, is really a quest, a quest for truth about identity, the kind of story that is as old as time itself, here with a modern twist." This is a great memoir - elegantly written, humble, absorbing, endearing and enlightening. Peter has been courageous in his frank account of his own life and generous in his revelations about others. The book reads as an honest record and avoids the self consciousness that can come from having one's reader sitting on one's shoulder. Peter just gets on with the tale, almost for its own sake. It feels like a privilege indeed to have read The Lie that Settles. There are many parts that have settled with me and left their own, positive, effect. 'The Lie that Settles' made a strong impression when I read it. Peter's deft and understated prose has stayed with me weeks later. He knows just when and how to put you right into the 'action' or leave spaces for your own imagination to fill. On one level it's a contradiction. A personal and reflective memoir of a private person who does not seek the limelight. The result is a nuanced story rich and revealing of the context that shaped the person Peter has become. Those more self-centered would have given context a lesser role but Peter is too honest to do that. Thus might we reflect more thoughtfully on our own lives and circumstances. When I heard Peter was publishing a memoir I said that I would be happy to write a review; well it would be easy, I write myself and have no difficulty in sitting down and running off a few hundred words so it was going to be a breeze. Or so I thought, now this is the easy bit. Peter has written a lucid and absorbing memoir. It is clear and to the point; free of the valedictory tone, the self justification that marks so many autobiographical works. It is honest and pulls no punches and the writing carries you along with the narrative. Now the bit that I found not at all easy; I have to declare an interest here, I am an old Red Hillian, a former pupil of the school where Peter grew up and where his mother was matron. I knew MOF and saw Peter several times in the early 1960s although I doubt he remembers me, he was working and living away from RHS, I was barely into my teens. It hadn’t occurred to me that having been there for a brief moment in Peter’s tale and having known some of the people involved would make writing about it so difficult. It did, it has, and I can only hope that these few words do the book some justice. The temptation was to write a memoir of my own but this is Peter’s tale not mine. When the book arrived I read it through in one sitting and I'm not ashamed to admit that in places it moved me to tears. It brought back many memories; it made people I thought I had known live again and in the case of MOF showed me what a truly remarkable woman she was. We were a strange community and I have come to realise that we were in many ways boys and staff (the ones who lasted) kindred spirits. I owe a great debt to MOF and the others, a debt that can never be paid. I am indebted to Peter for making the past live again and for shining a light on things that we were unaware of at the time. This book is more than a memoir; it is a tribute to a remarkable woman, Marion O’Farrell; it is a contribution to the history of a great school and a contribution to the social history of the times both MOFs and Peters. A very well written and deeply humane account of Peter’s journey through life plus his dogged determination to know his father’s identity, then decades later his quest to find him. I found this book captivating, absorbing and hard to put down! Like Wilf, I was moved to tears in several places. I attended Red Hill School in the early sixties where his mum Marion (MOF) served as Matron. This book is a great tribute to her. MOF had to be strict in her role as Matron and indeed she was. However, she could also be very kind and understanding. I have very warm memories of her.